The weasel war dance is a colloquial term for a behavior of excited ferrets and weasels. In wild animals, it is speculated that this dance is used to confuse or disorient prey. 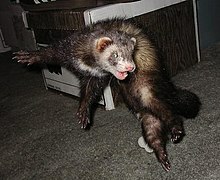 In domestic animals, the war dance usually follows play or the successful capture of a toy or a stolen object and is commonly held to mean that the ferret is thoroughly enjoying itself. It consists of a frenzied series of sideways and backwards hops, often accompanied by an arched back, and a frizzy tail. Ferrets are notoriously clumsy in their surroundings during their dance and will often bump into or fall over objects and furniture. Most often, the act includes a clucking vocalization, commonly known as “dooking”. It normally indicates happiness.